The Eastern Orthodox Churches celebrate the feast of Dormition of the Mother of God on August 28. This feast celebrates the bodily taking up of the Virgin Mary into the heaven. 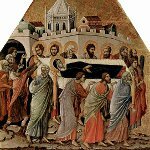 There are some differences between the dogmas in the Catholic Church and the Orthodox Church, concerning the death of the Virgin Mary and her assumption. The Catholic Church teaches, that the Virgin Mary's body and soul were assumed into the heaven before her death. And the Orthodox Church states, that the Virgin Mary first died, then only she was assumed into the heaven. This controversy affected on the observation of the feast by different churches. Many Christians follow the fast, that proceeds the feast. The fast lasts for two weeks and it's very strict: red meat, meat products, poultry, diary products, oil, fish and wine are prohibited to eat. A special liturgy is held on the feast of Dormition of the Mother of God in every Orthodox Church. The feast of Dormition of the Mother of God is a very important holiday in the countries of Eastern Europe. This is a public holiday in Georgia, Serbia and in the Republic of Macedonia.